The term spectral beam combining (also called wavelength beam combining or simply wavelength combining, or incoherent beam combining) denotes a class of techniques within the more general area of power scaling by beam combining. The goal is to combine several high-power laser beams so as to obtain a single beam not only with correspondingly higher power but also with more or less preserved beam quality and thus with increased brightness. An alternative class of techniques, discussed in a separate article, is coherent beam combining. The general principle of spectral beam combining is to have several beams with non-overlapping optical spectra and combine them at some kind of wavelength-sensitive beam combiner. Examples of such combiners are prisms and diffraction gratings, which can deflect incident beams according to their wavelengths so that subsequently these all propagate in the same direction. Other approaches rely on optical components with wavelength-dependent transmission, such as dichroic mirrors or volume Bragg gratings. For combining the outputs of a large number of different emitters of the same type, each emitter (laser) needs to have an emission bandwidth which is only a small fraction of the gain bandwidth, because a larger bandwidth would lead to a reduced beam quality. Furthermore, the beam combiner must have a sufficiently strong dispersion (e.g. angular dispersion), and the wavelengths of all emitters must be sufficiently stable. 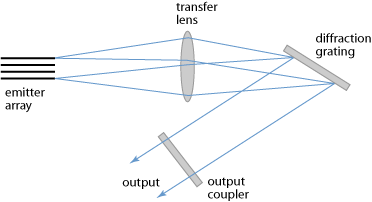 Figure 1: Setup for wavelength beam combination with a diffraction grating. Each wavelength has its own diffraction angle at the grating, and the emitters automatically tune to the wavelengths corresponding to their location. For clarity, only the beams of the outer emitters are shown. Some approaches build on emitters which are independently tuned to some wavelength, and their outputs are aligned to reach the beam combiner (e.g. a diffraction grating) at the corresponding angle. It can be advantageous, however, to modify the scheme such that each emitter automatically adjusts its wavelength according to its spatial position. This is achieved e.g. with a setup developed at MIT Lincoln Laboratory [1, 5], as shown in Figure 1. This principle was first applied to laser diodes in the form of diode arrays , but is also suitable for fiber lasers . Whereas diode lasers have the advantages of being directly electrically pumped and of being very efficient, fiber-based systems can have a higher power per emitter, and the emitters can have a broader gain bandwidth, so that much higher powers are possible. Of course, power scalability can be limited, e.g. by thermal effects on the wavelength-sensitive beam combiner. For transmission gratings, in particular, this introduces severe limitations, whereas reflection gratings could work at power levels of at least 100 kW, because they absorb less power and can be cooled from the back side. Compared with coherent beam combining, the technique of spectral beam combining has the great advantage of not requiring mutual temporal coherence of the combined beams. This eliminates some important technical challenges and makes it much easier to obtain stable operation at high power levels. On the other hand, the multi-wavelength nature of the output is then unavoidable, which may not matter for some applications while excluding others where a narrow-bandwidth output is required.